Restroom Remodels have found that most experts agree that electric hand dryers are the most sanitary method of hand drying. Today�s technology in high speed hand dryers offers public restrooms a higher standard in sanitation while eliminating paper mess. Hands are literally dry in just 10 seconds. Restroom Remodels Company offers a wide variety of hand dryers to choose from. 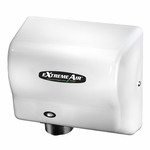 We are a Master Distributor for eXtreme Air Hand Dryers and also offer Bobrick High Speed Hand Dryers as well as Dyson High Speed Hand Dryers, Mitsubishi and Xlerator. Go "Green" with us today!